This headlight is designed to tilt with your head movement so you can stay safe when you’re cycling. Cycling is an enjoyable activity for many, but when it comes to riding at night, there are quite a few dangers that affect even the most experienced cyclists. While there are plenty of lights for cyclists on the market, the primary limitation of those devices is that the beams are fixed at a specific angle. Speednite is a smart headlight that is designed to move based on head movements from the rider. Unlike traditional headlights which lock into place, Speednite is a tilt-able (800 lumens) light with a maximum vertical movement of 130 degrees. The headlight supports multiple modes including full light, half light, fast flash, and slow flash. The device is designed to be water resistant. It’s powered by a removable rechargeable battery that can be charged via micro USB at home or on the go. In addition to being a headlight, the device also helps keep cyclists safe with a couple of additional safeguards such as side laser indicators that flash based on the direction the rider is planning to turn. Should the rider get in an accident while cycling, Speednite comes with an auto SOS warning function that triggers ten seconds after the helmet sensor detects an abnormal impact. Speednite then activates the SOS signal light, and the companion mobile app also notifies the selected emergency contact. In addition to the head motion controls, Speednite also includes a wireless handlebar remote control that enables users to manage the system manually. It provides headlight control, left/right indication control, and hazard light control. Although the movable headlight and safety components of Speednite are notable, what really sets the device apart from traditional cycling lights is the device’s built-in cycling computer. 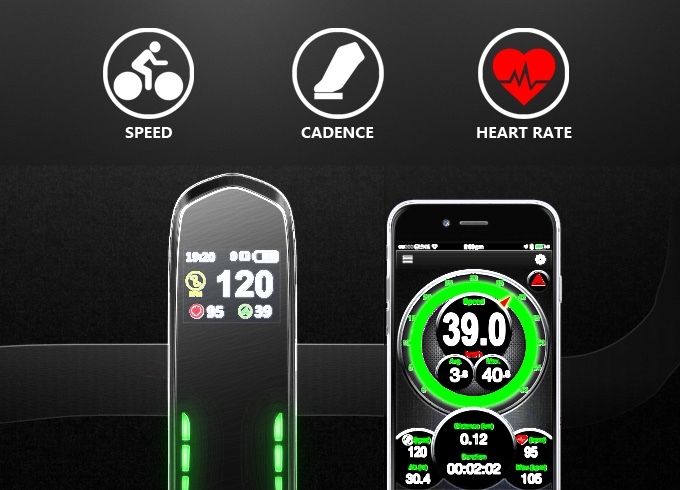 The computer has a 1.44” front color screen, supports third-party BLE cycling speed sensors, has a BLE cycling cadence sensor, and is equipped with BLE heart rate sensor connectors. When connected to the Speednite app, the computer also captures cycling data for later review. Speednite has a battery life of two hours when used at maximum power, or it lasts for 4-40 hours when in half/flashing light mode. The core device is sized at 200mm x 48mm x 61mm, weighs 330g, and has a stem length of approximately 90 to 100mm. The head sensor is 40mm x 25mm x 10mm and has a battery life of ~24 working hours per charge. The wireless remote is 33mm x 30mm x 10mm and has approximately a six-month battery life. So far the makers of Speednite have raised over $10,000 towards their goal via crowdfunding with an estimated shipping date as early as October 2017. Early bird pricing for the device starts at HK $1,200 and includes a Speednite stem, a head motion sensor, a wireless control, and a rechargeable battery. This sounds interesting, wonder where I can find something like this? It is pretty rad that the position of the helmet on your head is going to position the light one way or another. That is a sweet advancement in the bike safety industry. I use a Led Lenser 1000 lumen head lamp mounted on my really old Bell V1-Pro Brain Bucket. To lessen “The Weight Issue”, I use the included extension cord for the battery pack and wear it on my belt/edge of cycling shorts etc. For ride data I have a Cateye wireless cycling computer. I get a lot more than 2 hours lamp time and carry a fully charged spare battery. 1000 lumens directed light can really get the attention of motorists who can sometimes drift into my lane and on light traffic secondary streets (which are my pref anyway) obstacles and uneven terrain and even ice patches in winter are easier to spot. At this time, $1200 HK is about $205 CDN, not terrible, but Prob low when customs, duty, taxes, shipping and an extra battery (a must if the 2hour lamp time is accurate!) are factored in. At any rate, it is a very good thing to see someone putting all the functions together in one device. Especially when considering that it all comes together on a single phone app as well! Nice, thank you for the additional information! Having weight on bikes is preferable to having it on helmets. It’s more comfortable especially for longer rides. Also, there’s concerns about bike lights affecting the safety of helmets. There’s benefits of making the bike light multi-function. It’s much easier to use and safer. For cars, their speedometers, alarms, turn signals, head lights, tail lights, and RPM gauges come together. For a bicycle, it’s very important to avoid a crash because of the lack of armor. Pretty cool product. Safety is a big concern when you bike every day. I like the idea that I can go into manual mode if needed. That would have been a deal breaker for me. I am surprised at the battery life of the sensor. For something like that I would have expected at least a couple of days, if not a week. Either way, its a good start to a safety product for the cyclists out there! I am on board with all of the safety features this product brings to the table. The founders were really looking outside the box when putting this one together. Other than the app that has all of that wonderful information on it, I am not sure how much I would benefit from the light moving with my head. I am always looking around and I wonder if that is going to cause more of an issue compared to being a benefit.